There’s a secret hidden at the heart of quantum physics. Like most secrets that have been successfully kept, this secret is peculiar and a little embarrassing. It’s also the single most astonishing discovery ever made in the history of science. It is the strangest thing that I know, and I want to share it with you. It’s called Bell’s theorem. Proving Bell’s theorem is usually something that’s done furtively in the back of quantum mechanics textbooks. We’re going to do it right here instead—and we’re not going to use any complicated equations to do it. Instead, we’re going to use a casino. A new casino has opened up in the small town of Bellville, California—and it’s owned by Ronnie the Bear, who is suspected of having mob connections. You’re an inspector for the California Gaming Bureau, and you and your fellow inspector Fatima are heading up to Bellville to check out the casino before it opens, because you know Ronnie is probably up to something. When you get there, you find that Ronnie’s casino floor has an overcomplicated roulette setup. In the center of the room is a large machine, with a chute extending out from each side to the roulette tables at either end of the floor. At each of the two roulette tables, there are three roulette wheels, with a smaller spinning dial in the center. In accordance with state law, the roulette wheels only have alternating squares of red and black on them, not numbers—roulette wheels with numbers on them are illegal in the state of California. (Really.) Once you and Fatima are each seated at one of the tables, you each select one of the three wheels in front of you. Then Ronnie presses a button on the machine, and a roulette ball appears in each of the chutes, rolling toward the tables. Click or tap the center of a wheel to select it, then press the "Run Casino" button. You know Ronnie must be up to something with this overly-elaborate setup—you’re just not sure what. So you run the casino’s roulette machine many times over, choosing the wheels at each table randomly after the balls have been released, and you and Fatima each record the results at your table in your notebooks for later analysis. This time, just click "Run Casino" to run the roulette ball machine—the wheels are selected randomly while the balls are en route. When you get back to the hotel room, away from Ronnie’s prying eyes and security cameras, you and Fatima pore over your notes. You find that each table’s roulette wheels really do seem completely random—red and black each come up almost exactly half the time. But when you and Fatima compare your notebooks, the two of you immediately see something is fishy. “Look,” Fatima says. “Every time we used the same wheels at our tables, the roulette balls landed on the same colors!” You head back to the casino after hours to check things out. Click or tap the center of a wheel to select it, then press the "Run Casino" button. Results will appear in the log below. Fatima is definitely right. And you also confirm that balls in matching wheels definitely land on matching colors even when you pick the wheels after the balls are on their way to the wheels. Just click "Run Casino" to run the roulette ball machine—the wheels are selected randomly while the balls are en route. Results will appear in the log below. Ronnie must be cheating! How? You and Fatima talk it over. The roulette balls always pick the same colors at the same roulette wheels, even when the wheels are chosen while the balls are en route. Therefore, the roulette balls must be coordinating their decisions in advance somehow—before they even leave the central machine, the roulette balls must have matching instruction sets that tell them both to do the same things when they arrive at each of the three wheels. Just click "Run Casino" to run the roulette ball machine—the wheels are selected randomly while the balls are en route. This time, the balls carry hidden instruction sets telling them what to do at each wheel. Results will appear in the log below. But then Fatima notices a second pattern in the results. “Look at these results,” she says. “When the wheels don’t match, the colors only match 25% of the time,” Fatima says. You may need to run the machine through this sequence several times for the statistics to build up. P = the fraction of runs with mismatched wheels and matching colors. “OK,” you say, “I believe you. But so what?” “That number, 25%—it’s impossible,” Fatima says. “They have to match more than that if the roulette balls are sharing instruction sets.” Fatima rips a page out of her notebook and starts scribbling on it. The problem, Fatima points out, is that they all have matching colors more than 25% of the time for mismatched wheels. If the two roulette balls are sharing either of the instruction sets in the top group, then they’ll match 100% of the time, even when they end up in differently-numbered wheels. And if the two roulette balls are sharing one of the instruction sets in the bottom group, then when you and Fatima are using differently-numbered wheels, the balls should land on the same color one-third (33%) of the time. Select a set of instructions, then run the machine. Again, you may need to run the sequence several times for the statistics to build up. Whatever’s going on, one thing’s for sure: Ronnie has got you good this time. Ronnie’s casino actually exists. But the roulette balls there are not really roulette balls—they’re pairs of photons, tiny packets of light. The roulette wheels are polarizers, machines that measure polarization (a property of light) along three different directions, selected randomly while the photons are in flight toward the machines. The two photons in each pair are “entangled” with each other, which is a term from quantum physics that just means the photons behave in the bizarre way described in the story about Ronnie’s casino. And Bell’s theorem is the proof embedded in the story, the one that you and Fatima figured out. Just as in the story about the casino, there’s something strange going on with these photons, and it can’t be accounted for by assuming the photons have hidden instructions that they carry with them from the moment they separate. And entangled photons really do behave this way, so something very strange must be going on in quantum physics. But what, exactly, did Bell prove? To understand this, let’s take a closer look at what happened at Ronnie’s casino. We started out with the assumption that roulette balls can’t magically communicate with each other instantaneously across long distances (though we never explicitly stated this until the end). Physicists call this no-instantaneous-signaling assumption “locality.” This idea of locality led us to the conclusion that there must be hidden instruction sets in the roulette balls themselves, because that was the only way to account for the perfectly matched outcomes when you and Fatima used the same roulette wheels. But the fact that your outcomes didn’t match more than 25% of the time when you didn’t use the same wheel as Fatima ruled out the possibility of hidden instructions. Therefore, something must be wrong with our assumption: locality must be violated. 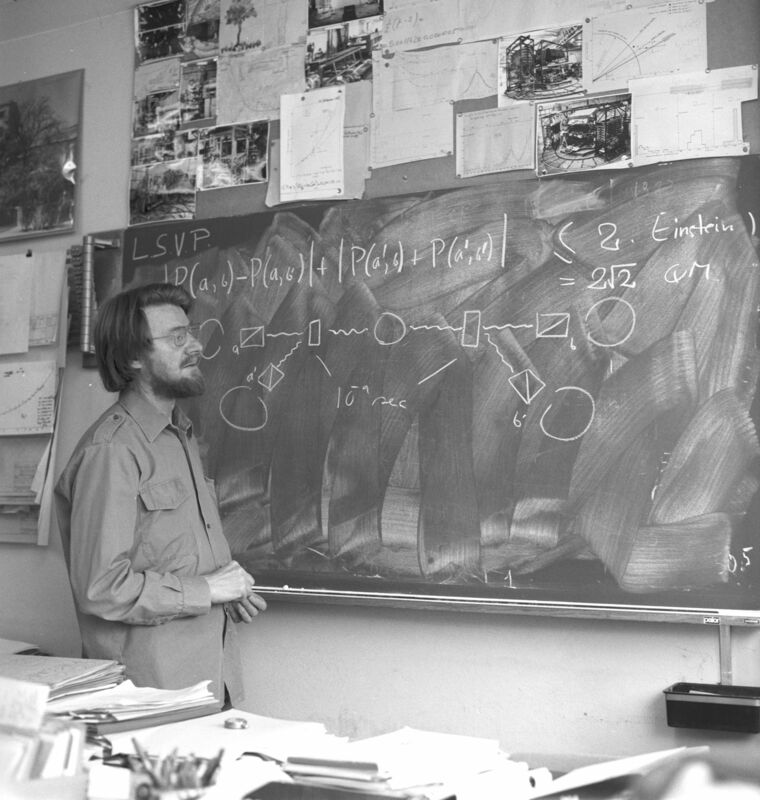 John Bell discussing experimental tests of his theorem, 1982. Image courtesy of CERN. There might be other ways out of Bell's theorem: branching multiple universes, signals sent backward in time, or even vast cosmic conspiracies that go back to the Big Bang itself. But these options are even more strange and controversial than nonlocality. And some physicists have suggested denying the very idea of an external reality in order to avoid the conclusion that nature is nonlocal. But denying realism to break Bell’s proof invariably breaks the concept of locality as well—a Pyrrhic victory for those determined to keep physics local at all costs. In short, Bell's theorem tells us that either there are subtle signals in nature that can travel faster than light, or something even weirder than that is going on. Either way, Bell's theorem gives us a glimpse at the true face of the universe, revealing a world that is utterly different from our everyday perspective on reality. This is just one glimpse of the bewildering subject at the edge of physics known as quantum foundations. There’s more—there’s a whole history of interpersonal clashes and political struggles among the physicists grappling with the very strangest concepts science has to offer, and a tantalizing challenge to the future of quantum physics. Elisabeth Seng, Glen Chiacchieri, Nicky Case, Peter Tallack, and TJ Kelleher. This presentation of Bell's theorem is based primarily upon the excellent paper Is the Moon There When Nobody Looks? by N. David Mermin. However, the creators of this website are solely responsible for any errors herein. 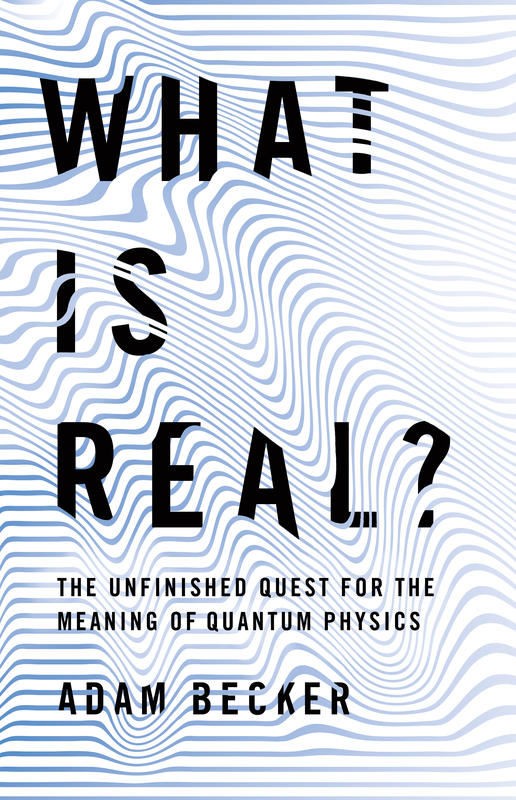 The research and writing of What is Real? was made possible in part by a generous grant from the Alfred P. Sloan Foundation's Public Understanding of Science and Technology Program. Copyright 2018 by Adam Becker. The written content of this website, along with the images (other than the photo of John Bell) are all available under the CC BY 4.0 license. The underlying code is available under the MIT license, and may be found here.